This week Fitzpatrick Painting is gearing up for the big weekend project for the winners of our Paint it Forward project! We are very excited to work with so many companies in the area to complete the remodel of their home! This Friday and Saturday volunteers and contractors will all come together to make this all happen in just one weekend! We will be putting before and after photos up soon so make sure that you stay tuned to our blog! Again we just wanted to say congratulations to the family and a HUGE thank you to all of the participating companies who have helped out with this project. 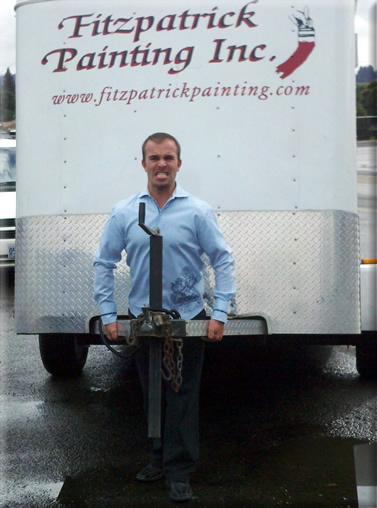 painting exterior houses this summer in the Albany, Corvallis and Eugene areas that we even had Tim Fitzpatrick pulling paint trailers! If there is one simple way to bring your house into the 21st century, it is with paint. No matter when your house was built, what the architectural style is, what the landscape looks like, color and all its combinations can give your house a current look. House paint is a long-term commitment though. Unlike fashion, what is up to date today will still need to look good later on. So how do you pick a color that won’t conflict with your idea of style 10 years too soon? 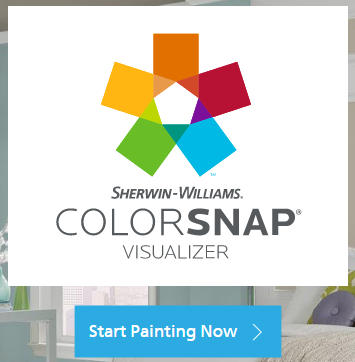 Color experts have already thought this through. The Color Future Group at ICI Paints in London and the Color Stylist Group at PPG Industries in Pennsylvania already know what your future looks like. These are the people who predict color trends, such as the shade of handbag you’ll be carrying next year or the color of the car you’ll drive by the end of the decade. Inside colors are moving outside. Greens, browns and the colors of stone are responses to the environmental movement. Punch colors such as red and oranges are going on front doors. Designers are pulling exterior colors out of the landscape, We are mixing more greens and browns than ever. One of the most sophisticated ways to think about color is to imagine sinking your house into the land. Instead of a lemon-yellow house that looks as if it was plopped on top, envision a color that makes your house look like it has grown out of the ground. Landscape architects are finally working with color palettes in the beginning stages of construction so the home color becomes the backdrop to the eventual landscape. Whatever you choose, know that you are going to live with your decision a long time. Unlike your latest throw pillows, exterior colors need to endure, to make your investment last. It’s a big-ticket item to paint the outside of your home. Take care of it. Power-wash your house once a year for a fresh look and it may look newly painted all over again. A low-cost paint job will look fine for a short period – but it will be obvious within months that you didn’t get quality work or materials. Cover these points with each painter you interview – you’ll soon have a good idea who will provide the work you’re after. * Use backer rod for large gaps (good), or just fill with caulk (bad)? * Use sharp scrapers or dull putty knives to remove paint? Attention to detail is essential to the final result. Most homeowners won’t know about shortcuts taken with tedious prep work until well after their check has been cashed. Every paint manufacturermakes a range of products – from very high quality to a very low price. A painter should be able to explain which product he uses, where it falls in the product line and just what the difference is beyond “it’s a better quality product”. This is true for primer and caulk as well. Cheap caulk dries out and pulls loose, cheap primer is watery because it has fewer solids. Understand what you’re paying for and verify what you get. Materials are often not included. This is a huge unknown for homeowners – no incentive for the painter to eliminate waste or estimate paint quantities accurately. A low materials estimate makes the bid look better; accurate materials estimates do not. Proposals that include the cost of materials bet on the painters’ expertise, and give the homeowner a better view of their final cost. Workman’s Compensations insurance is required by law; liability insurance is required by common sense. Some painters have neither. No homeowner wants an uninsured worker slipping off a high ladder. Make sure your painter can document that he and his employees are properly insured. A certificate of insurance issued for your specific project, at your specific address, is routine for commercial insurance carriers. Subcontractors? Each individual worker needs to have his own current, up to date certificate. Closely supervised, experienced painters will always deliver a better job than unsupervised, inexperienced workers. Proper attire (painter’s “whites”) is an easy guage of the level of professionalism. 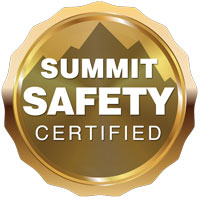 An agreement that eliminates assumptions about type of work to be done and a supervisor that clearly communicates with his crew and the homeowner will ensure that all expectations are met. A professional crew can paint most houses in less than one week. If you’ve hired a crew of one, or they work a “flexible” schedule, they may be a part of your life for quite a bit longer. Great, if you don’t mind them using your bathroom, but most homeowners want to get the whole thing over with sooner rather than later. At the other end of the spectrum are the “blow and go” or “quick-change” artists – quick prep, quick spray, collect the check and outta here. If that’s what you’re paying for, OK, but not so good if you’re paying for a top-notch job.